In the following years, he participated in music projects with other artists and he became a regular guest of the Chantenay-Villedieu festival. Meeting other artists he developed a very personal approach with his music and his instrument in improvised music. During this period he played with Europeans musicians: Fred Van Hove, Phil Wachsmann, Max Eastley, Steve Beresford and Americans: John Zorn, Eliott Sharp, Elvin Jones. More recently he developed his work with Keith Rowe, Günter Müller, Bhob Rainey, Giuseppe Ielasi and dancers as Masaki Iwana, Yukiko Nakamura, Valérie Métivier and poets, actors. 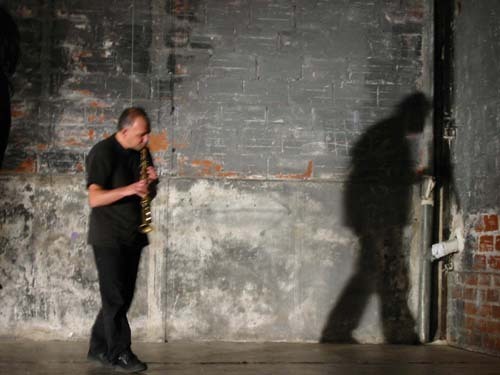 Since then, he has been very involved in the international improvised music scene, toured in Africa, Japan, Asia, USA, Canada, South America, Russia and with a lot of improvisers in Europe. In 1992 he founded in Toulouse with musicians, actors, poets, dancers the association: La Flibuste. As of today he recorded almost 50 records for European, Americans and Japanese labels. Various Artists: Musiqueaction #03 (Vand’Oeuvre, 2002). 1995, Les diseurs de musique, Vand’Oeuvre VD0 9814. Various Artists: Joyeux Noël (Nato 1988).